The Marcellus Effect: Seneca Protesters Ask: Just Who is Doing the Trespassing Here? 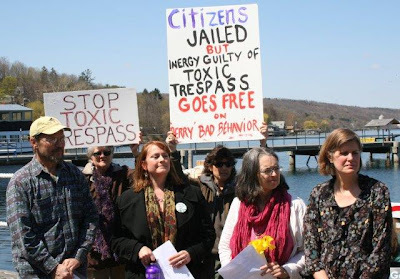 Seneca Protesters Ask: Just Who is Doing the Trespassing Here? Three protesters of conscience - Melissa Chipman, Michael Dineen, and Sandra Steingraber - gained their freedom in the wee hours of midnight/morning. They were released from custody a little after midnight in front of the "Public Safety Building" - no irony intended, given that they were arrested for protesting what they see as a very unsafe situation: Inergy's proposed natural gas/propane storage facility in the salt caverns edging Seneca Lake. Today at 1 pm the three returned to Seneca Lake to talk about their experiences. "I come out reforged and rejuvenated for the fight ahead," said Steingraber. Seneca Lake serves as a drinking water source for 100,000 people. Inergy's project puts that at risk: risk of leaks, risk of explosions, risks of air pollutants. Furthermore, the company is not in compliance and has experienced two brine spills in the past three years. "But I don't see anyone from Inergy wearing an orange jump suit!" All three were arrested from trespassing when they protested in March against Inergy's planned storage plant. But, who are the trespassers here? they asked. The people who live in this community? Or an out-of-town company that hides crucial information and engages in bad (polluting) behavior? The three protesters, part of a larger group calling themselves the Seneca 12, tried all legal channels they could to halt what they see as a travesty happening on the lake. And once you've followed all those avenues and had no answers, what's left? asked Steingraber. Dineen, an organic farmer, sees himself as just an ordinary person. We can write letters, he said, attend rallies, make comments. But when these don't work we have to turn to blunt instruments, like standing in front of a gate. "I'm going to defend my land, my family, and my granddaughter's future," he said. It is so disheartening to hear what is really going on. I wish all the pro-gas people in my town would get off the road, open their car windows, and stay awhile to hear, smell, see what it is truly like for you. I am so sorry that you have to suffer. yes, who are the real "trespassers" and invaders? Keep following the trucks with your video camera, keep documenting the county boards and town boards. Thank you for all the work you are doing to document what is really going on.